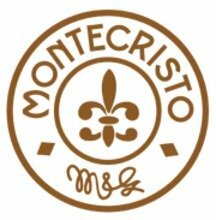 Many cigar connoisseurs regard the famous Montecristo cigar brand as the finest cigar in the world. These same folks consider the Robusto to be one of the most popular sizes in the world. Put them both together and you have the Montecristo fan favorite Robusto. This compact smoke offers the perfect balance of excellent construction and the rare blend of exquisite tobaccos carefully rolled into every Montecristo cigar. 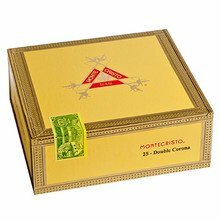 The Montecristo Robusto is housed in the classic yellow dress box loaded with 25 cigars. Enjoy montecristo? Enjoy Churchill’s? Short on time? Try this stick and you won’t be disappointed it is as good as its larger counterpart. I've been a Monty Smoker for well over a decade. My level as a very occasional Hobbyist though left me with my last box of No. 2s lasting for several years. Returning to resupply in one week smoking a Monty a decade old the next one brand new, allowed me to see what some others have discussed. This is simply not the cigar it used to be. Flavor opened with pepper and spice and mellowed slightly as it progressed. No real evolution of flavor as years past, and I'm missing some complexity, certainly not disagreeable however. I would rate the strength as a definite "Medium" albeit slightly on the lighter side of medium. Construction, Burn and Draw were all good. The bottom line is, it was good, however that means it is no longer great. The bottom line is Monty remains a "good" smoke, but now, sadly is overpriced. I, nor you, should be paying $10 a stick for "good". If you are curious I highly recommend trying a sampler for yourself. But at this point, spending big money to get a box of cigars is best spent elsewhere. Excellent smoke nice and smooth with a good burn. Little pepper gives it a nice kick flavor remained consistent all the way through. I typically go for the no. 2, but if you want the Montecristo with a shorter smoke but bigger punch, this is the way to go. It’s a montecristo does anything more need to be said? I enjoy this one occasionally while out walking the dog. Had this at a cigar event. It was good but was way milder and flavorful than I anticipated. You really can't go wrong with a montecristo.This cigar was given to me ,it was ok but I would rather smoke something longer .It did not have a good draw and didn't burn evenly,wasn't sure if it was stored correctly so this may have had something to do with it. Old faithful these should be called. Easily found at the gas station and easily smoked. These are the cigars that make the cut for premiums but dont expect to be blown away. A solid smooth smoke and toasty flavor. 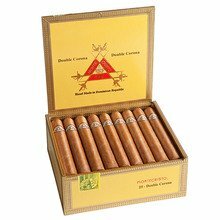 The montecristo robusto is an excellent example of a finely rolled, excellent smoke able cigar, easy to enjoy these as they are quite reasonably priced. A man’s cigar! Always spicy, strong body! Perfect match with whiskey! It leaves your tastebuds wanting more! Montecristo always makes a great cigar. This one is no different. A nice smooth smoke. Can't go wrong with a montecristo. Awesome flavor great draw and construction. New smokers to seasoned ones will enjoy them. Buy a fiver and see what they all about its all my neighbor smokes. Montecristo Robusto never fails to satisfy. If you are to rate cigars, you must have this beauty in your humidor as the standard. If you are looking for a consistent and trusted stick, start here. It will also elevate your aficionado status.